Every lady in Moab is invited to join our events and educational opportunities during Easter Jeep Safari. 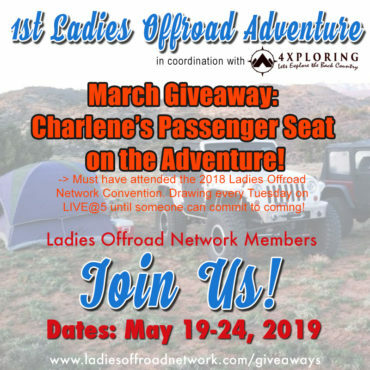 • 5:00 PM PST: Join Charlene LIVE@5 via Ladies Offroad Network Facebook or Instagram Stories to see the winners of the Tuesday Night giveaways and hear the recap on the week! Sign in now which will help the registration process at the event. No worries if you don't...come! Bring your friends! It's all FREE. 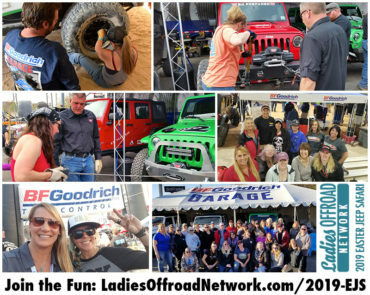 Every lady in Moab should stop by our Ladies Offroad Experience on Tuesday, April 16th at the BFGoodrich Tires Garage (Grand Tire Pros, Main St). Join a casual atmosphere where you can meet the ladies at Easter Jeep Safari, swap stories, or make plans to go on the trails. We all have a lot in common, it just takes a few minutes to get the conversation started. Throughout the early evening, ladies can change a BFGoodrich Tire on Frankie, the Ladies Offroad Network Jeep. WARN Winches will be giving ladies the opportunity to reel a winch line. 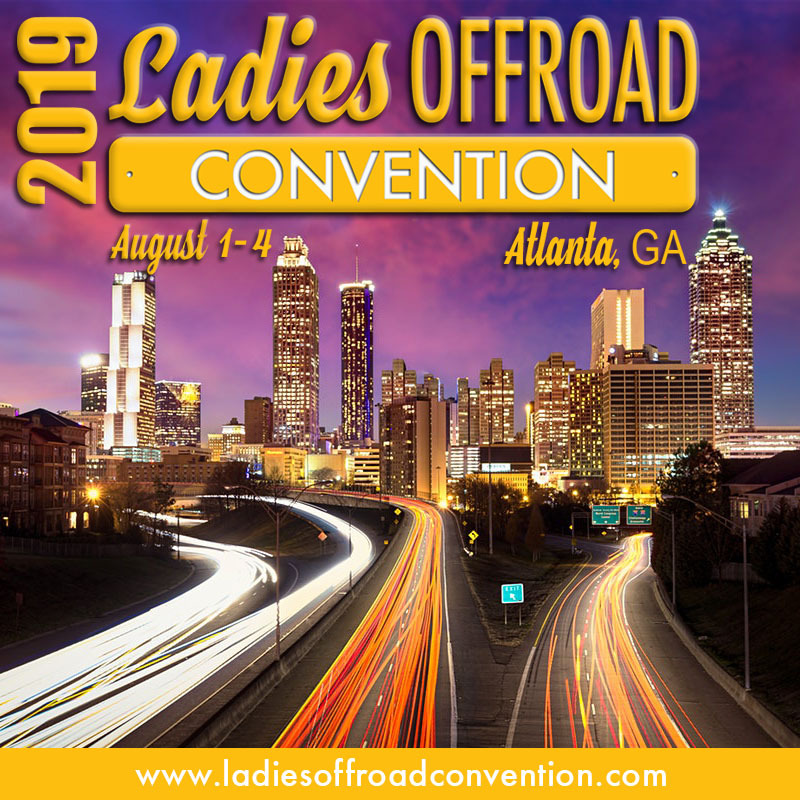 Hi-Lift will be teaching ladies how to operate a Hi-Lift Jack, and Pull-Pal will be showing ladies how to use their signature device, the Pull Pal. Jessi Combs will be in attendance signing autographs. The online version BFGoodrich Tires Garage will be set up looking for you to tell your story. 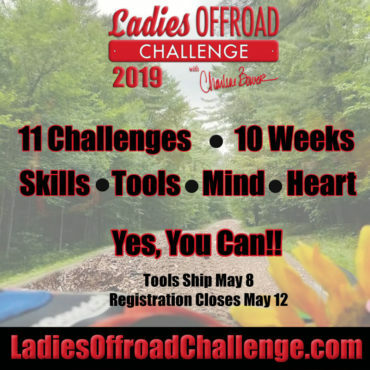 At 6 PM, Charlene will announce the 2019 Ladies Offroad Challenge. Water and snacks will be provided. Ladies in attendance can enter to win various giveaways from our partners! You do not need to be present to win. Winners will be announced via Facebook or Instagram LIVE@5 PM PST on Tuesday, April 23rd. You have to eat. Charlene has to eat. So let's meet and eat together! Join us on Thursday and Friday at the vendor show in the Grandstands behind the BFGoodrich Tires and Mac's Tie Downs booth. We will be sitting there enjoying our lunch (bring yours) and chatting. This is a great opportunity to get to know other ladies...who are a lot like you...we don't mind dirt under our nails. At one point last year Charlene looked around at the group that was sitting there and realized that there were 6 buggy girls...and they didn't even know it! A quick STOP on all conversations so this amazingness could be announced and then the volume of chatter skyrocketed! Guests are welcome at EVERYTHING that we do, but Ladies Offroad Network Membership has its advantages. We are constantly adding value. Membership is $9.99/mo, 10% off: $27/qtly, or 20% off: $97/yr. Click here to discover the benefits of membership. 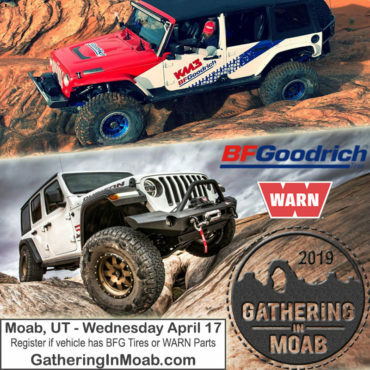 BFGoodrich Tires™ and Warn Industries have partnered to host the 6th Annual Gathering in Moab. This unique event hosts guests from across the country who will join exceptional trail leaders for a day on the Moab trails followed by an evening at an iconic Moab location for dinner with industry professionals. Guests at all levels of ability are welcome to register, from the buggies on 42” BFGoodrich Tires to the stock Jeep with a beginner driver, with a minimum of one partner product on their vehicle. Click here for more information and to REGISTER. * Registrants must support at minimum one of the above mentioned partners in product choice.